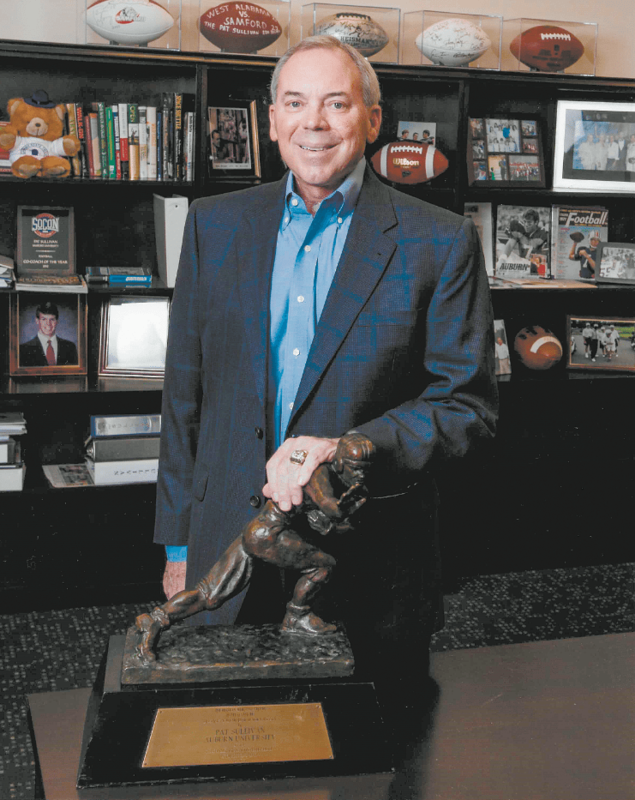 Just about every weekday afternoon, Pat Sullivan goes to his office on the third floor of the Samford football building that bears his name, the Sullivan-Cooney Family Field House. Sullivan is a football legend, a Heisman Trophy-winning quarterback at Auburn University and a member of the College Football Hall of Fame. Photo courtesy Auburn University Photographic Services. His personal assistant, Darryl DuBose, is right by his side, providing whatever help Sullivan needs. “He’s my brother,” Sullivan said fondly. Sullivan is a special adviser to Samford President Andrew Westmoreland for campus and community development. He was the Bulldogs’ head coach for eight years before stepping down after the 2014 season. Sullivan, 68, also is a cancer survivor. He’s nourished through a feed- ing tube and has an oxygen tank to help him breathe. Both are the results of the radiation treatments that killed the cancer in his throat and damage from a later surgical procedure. Sullivan will be honored during the American Cancer Society’s Tee It Up Fore Life 2018 golf tournament at Old Overton Club on June 11. The tournament is presented by Medical Properties Trust. Participation and donations provide funding for American Cancer Society programs and services. “One of my close friends, Gary Cooney, has been involved with it and he has had people fight with cancer issues like I have,” Sullivan said. “It’s a worthwhile event and I want to do whatever I can to help. Libba Hardwick, senior manager of community development for the South Region of the American Cancer Society, is elated to have Sullivan as the honoree. Sullivan is a football legend, a Heisman Trophy-winning quarterback at Auburn University and a member of the College Football Hall of Fame. In addition to being head coach at Samford, he was head coach at Texas Christian University and an assistant at Auburn and UAB. He was the offensive coordinator at UAB when his battle with cancer began in 2003. That was 15 years ago and Sullivan still has an active life, spending time with his wife of 49 years, Jean, their three children and eight grandchildren. When he leaves his Samford office, he heads over to Mountain Brook High School to pick up his grandson Taylor Pankey from school. The Tee It Up Fore Life tournament begins at 11 a.m. June 11 with registration and the opening of the practice range. Lunch begins at 11:30 a.m. and the shotgun start is at 1 p.m. A reception and presentation of awards begins at 5:45 p.m.
People are encouraged to donate through the tournament website at teeitupforelifebham.com.